This approximately one hundred page book might be likened to a Christian fairy tale. Some reviewers have noted similarities to The Lion, Witch and the Wardrobe. Targeted for readers age seven and up, I feel that it will appeal most to tweens and young teens. The characters are charming, appealing, and fairly well developed for the length of the story. Plot involves a twelve year old girl named Ella, who lives in her grandmother’s urban house. One rainy day, she is asked to clean the basement. Ella reluctantly agrees; she finds a loose brick behind an old trunk. When she removes it, Ella finds a beautiful fantasy world on the other side. She steps into it and embarks on an adventure that involves a princess, her suitors, a unicorn, some mischievous monkeys, and a bear mentor named Sequor. 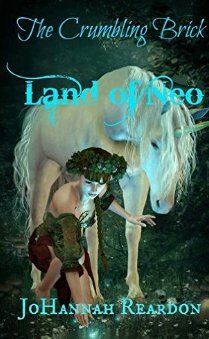 Ella learns that the wise and all-knowing Kosmeo has chosen her to save the land of Neo. Ward, her unicorn friend, will assist her in warning the princess Onyma that one of her suitors is involved in a plot to overthrow her kingdom. While the story is somewhat predictable, there are enough twists and turns with delightful characters and moral lessons to give the fairy tale a wide appeal to boys and girls alike. This book is the first of a series. It can be used as bedtime story, an independent chapter book or a classroom read aloud that combines many interesting elements for classroom discussion. If you enjoy fairy tales, give this one a look. This does seem similar to Narnia, and we love Narnia. Thanks for linking up at #LMMLinkup. I think that you will enjoy it! Hmm, I think I have at least one who would really enjoy this book! Thanks so much for sharing this at Booknificent Thursday on Mommynificent.com this week! I bet you do!…It’s a good choice!